IsaiahG has released a slew of impressive singles over the past 3 years, but has become notorious for holding back on dropping an actual body of work. The Southside Chicago lyricist has linked up with plenty of Lyrical favorites for tracks during this time period including Duffle Bag Buru, Saba, Sydny August, Supa Bwe, and $ike The Drug to name a few. 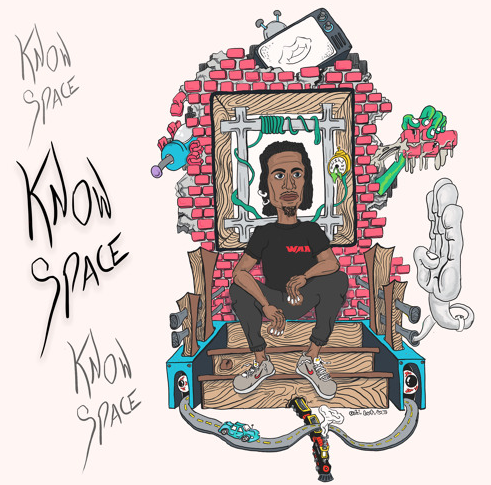 Today we are excited to announce the premiere of his debut EP, KNOWSPACE, a 6 track offering that gives us a glimpse of what IsaiahG is capable of. Executive producers, Aaron Deux and Cameron Butler design trance like waves combined with hard hitting percussion to create the addictive energy found in KNOWSPACE. IsaiahG brings a refreshing energy to the table with an arsenal of catchy flows and intelligent bars that we can’t help but replay over and over. We spoke with him about with him briefly on what he hoped new listeners to take away from KNOWSPACE and he said, “The title is a play on words from the fact that there is no space between IsaiahG which many people often don’t know…as well as this being my first EP so it lets people get to know my style.” His debut full length LP, CONTACT, isn’t set to drop until later in 2018 but for now you can get acquainted with IsaiahG by hitting play on KNOWSPACE and watching two of his Cole Bennet directed visuals below.